Hurricanes Harvey, Irma and Maria dealt a big blow to corporate America. More than 40% of companies in the S&P 500 that have reported third-quarter earnings so far mentioned the hurricanes on investor calls, according to a Sentieo analysis. Flights were grounded, stores were closed, manufacturing production was halted and customers didn't go out to eat. Corporate profits still surged, led by strong consumer spending. But Harvey and Irma cost companies around $20 billion in lost business, estimated Gus Faucher, chief U.S. economist at PNC. 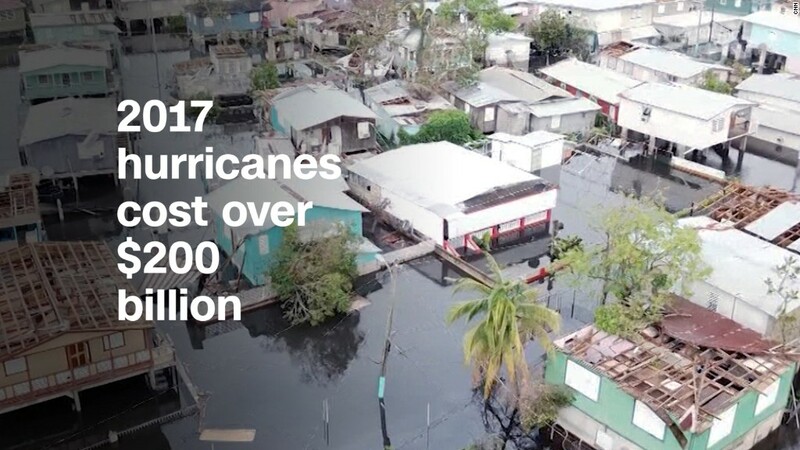 Mark Zandi, chief economist at Moody's Analytics, put losses as high as $22.5 billion in the U.S. and $30 billion from Maria's staggering toll on Puerto Rico. By comparison, Hurricane Katrina cost the country $30.9 billion in lost output, Zandi told CNNMoney. Nearly every industry in the country has a major footprint in Texas and Florida, areas battered by Harvey and Irma. Many have locations in Puerto Rico as well. But cruise lines and airlines were hit particularly hard, Bank of America economists said in an October research note. Hurricanes upended insurance companies too. The industry has posted $6.9 billion of losses so far, said John Butters, an analyst at FactSet. Travelers (TRV) alone reported it could suffer $700 million in losses from payout claims. Airline earnings were also weaker. United Airlines estimated $210 million in lost sales, while JetBlue (JBLU) said this week that the storms would cost it $90 million in revenue. On Thursday, Expedia (EXPE) reported $20 million in pre-tax losses due to fewer hotel bookings, while Goodyear Tires (GT) said Friday that it lost $23 million in sales. The hits landed in unexpected places too: Budweiser and Bud Light sales were down at retail stores because of the storms, Anheuser-Busch InBev (BUD) reported, and Harley-Davidson (HOG) said the hurricanes cut motorcycle sales between 1.5% and 2%. Storms somewhat slowed economic growth in the third quarter, since companies produced and sold fewer goods and services. The economy still grew at an impressive 3% from July through September, but it could have been even higher without the hurricanes. "If not for the hurricanes, the GDP would have been 3.5%," said Zandi. The economic rebound is already underway from the disasters and the impact should be short-lived, economists agree. "Most of the negative impact appears to be behind us," said Paul Ashworth, chief U.S. economist at Capital Economics. "There's no reason to believe that it would be anything more than a short-term hit." Zandi said lost activity from the hurricanes will be made up in the final months of 2017 and into next year. "If people didn't buy cars or go on vacation because of the storms, they'll spend that money later," he said. "Factories will eventually produce most of the output that they didn't make because of the storms." Auto sales rose 6.1% in September from the previous year, helped by GM's (GM) 12% spike and Ford's (F) 9% increase. The home improvement and construction industries even got a lift from the hurricanes, as people started rebuilding damaged homes and replacing flooded cars. Home Depot (HD) and Lowe's (LOW) reported upticks in September. United Rentals (URI), the largest construction rental equipment company in the country, cited hurricane recovery efforts this week to raise its outlook for the rest of the year.